The Museum Of Extinct Animals is many things. It is a labyrinth of dusty secrets. It is a fortress of fallen totems from another time. It is a symposium of ghosts. The Museum Of Extinct Animals is a cathedral-sized capsule containing stuffed creatures of rare distinction. Mythical creatures, post-extinction. There’s only one explanation for the discontinuation of animals in modern times – those whose demise we have noted in written records, as opposed to the dinosaurs who we only found out about when someone tripped over a massive Brontosaurus neck protruding from the sand one day – and that is: humans. The Museum Of Extinct Animals is that place where animals that no longer exist are gathered in a macabre zoo of man’s making. Here they are corralled and curated. They sit on shelves or in cabinets, stuffed and stitched, framed and mounted, perfectly pinned. These are creatures in perpetual stasis, immortalised in repose, never to stalk the meadows, swim the deepest briny oceans or fly across great fields of blood-red poppies in spring again. The Museum Of Extinct Animals is a maudlin place. Dust gathers in knee-deep drifts and the blinds are always closed. Thousands of dead flies and moths litter the surfaces of the glass cases as if they too are clamouring to be part of this grotesque menagerie. The silence is so deep and sorrowful it sounds like a gassed orchestra and the only light is that which finds a way through the tiniest gap in the old blinds that have been left unopened for decades. The building houses a collection of the world’s hunted, neglected, fetishised, collected, colonised, coveted, repressed, dissected, tortured and eaten. It is a monument to human greed and stupidity, a Holocaust memorial for the animal kingdom. A cenotaph to ignorance. No one ever enters the Museum Of Extinct Animals, except for the caretaker. He is too afraid to tell anyone about it in case the last remaining samples of once-glorious animals are stolen or destroyed. He lives in constant fear. Little else is known of the caretaker, other than that he is very old and has never married. Some believe him to be Austrian, though this has never been confirmed. He is paid a small stipend for his minimal caretaking duties each month by an organisation discretely registered to an address in France. When visited, it proved to be a charcuterie in a small Alpine village. Its owner claimed to know nothing about the museum or the caretaker and appeared more concerned with a late delivery of duck rillettes. To explore the Museum Of Extinct Animals is to undertake time travel. To enter it is to step into an alternative earth, a living map of different countries and eras and regions and climate changes and hunting patterns and food chains and urban growth and rainforest destruction and centuries of regress, all collated into one three-dimensional monument to misfortune. The creatures are weird and wonderful, ugly and beautiful, and all of them are extinct. Looking at them evokes first a fear of the unknown, as many of these species are unrecognisable, some having not been seen alive by human eyes for hundreds of years. There then comes a crushing sense of melancholy that follows the realisation that time only ever moves forward, and that you can never reverse death. It is just not possible. But it is not time that has slain these creatures, it is man, and for that perhaps it is he who should be gathering dust on a shelf in a pose that best represents his species: poised perhaps, with a rifle tucked under one arm and one hand shading his brow as he squints off into the distance with a hint of bloodlust in his eyes. That is the human stance. The killer’s posture. In many ways the Museum Of Extinct Animals is an inverse graveyard. The corpses have been unearthed from the soil of the past and exhibited, each with a name tag and a plaque with a date of final extinction on it. Some of the great losses are alarmingly recent, like that of the Pyrenean ibex, a wild horned mountain goat (rendered extinct on January 6th, 2000, Spain, exact time unknown, but most likely it was pre-siesta). This suggests that the museum’s collection is continually being added to, though no one knows when or by whom, because the Museum Of Extinct Animals mainly exists in academic papers and rumours, in urban mythology and Internet forums, in the imaginations of those who fall asleep at night dreaming of great plains and savannah clearings inhabited by all the species of history. There are those who might even be able to remember what it was they were doing the very day that the last Pyrenean ibex’s little heart stopped beating. Could anyone have done anything to help anyway? It’s difficult to say. Elsewhere in the museum there sit creatures whose extinctions stretch back through less ecologically enlightened times. Creatures such as the great auk (July 3rd, 1844, Iceland), an animal superficially similar to the penguin, “an excellent swimmer” whose wings doubled up as fins underwater but who, unlike other auks, could not fly, which made it more vulnerable to humans and other predators. So even now someone, somewhere, is quite likely sleeping atop extinction each night. Or what of the auroch (Poland, 1627), whose name translates as “primeval ox”, or “proto-ox” and of whom no photographs exist, only cave-paintings – for once, the horned auroch was an animal worshipped by humans and sacrificed to the gods accordingly. The mammal survived the Iron Age, changing weather systems and threatened food supplies and indeed flourished across Europe, but what it did not survive was continual encounters with humans. The auroch’s population dwindled and its movements became restricted to Poland, Lithuania and East Prussia. In 1564, according to a royal survey, Polish gamekeepers knew of only thirty-eight such animals. The last recorded live auroch was a female who, without a male with which to procreate, lost her entire reason to exist and curled up and died amongst the dead leaves and the comforting wet smell of woodland fecundity and decay. Location: Jaktorów Forest. Date: 1627. Exact day: unknown. The laws of probability suggest it was a week day. Perhaps you are now beginning to understand that the Museum Of Extinct Animals is no showpiece, no tawdry end-of-the-pier cheap thrill. No. It is a giant filing cabinet of human error whose contents are far too alarming to be seen by a mass populace more accustomed to entertainment and who would crumble if faced with the reality of their own atrocities. It is simply too sad a place to enter without due preparation. Of course, after a short time of reflection most visitors would then straighten up, dab at their eyes and become indignant, saying, “It’s nothing to do with me,” and then go about their business as if extinction itself was extinct. What is equally difficult to reconcile is why someone would go to the trouble to record the final execution of the last remaining animal of a specific species – the aforementioned great auk, July 3rd, 1844, for example – but not actually stop and do something about its preservation. When sailors speared that last auk on the island of Eldey, ten miles off the south-west coast of Iceland, they documented the minutiae of its demise. To do so they may have had to remove their fur-lined mittens to dig out a piece of paper and a gnarled stub of a pencil in those sub-zero, frostbitten conditions. But that’s as far as their commitment went. After all, you sleep much better on a down mattress than on a bed made from a glacier. The exhibits are arranged by species and continent. The North American fish section alone is nothing short of a roll call of senseless slaughter and greedy plunder, once poetic names now nothing more than dried-out relics: the Snake River sucker (Wyoming, 1928 ), the Alvord cutthroat trout (Nevada, Oregon, 1940), the Pahrump Ranch killifish (Nevada, 1956), the thicktail chub (California, 1957), the blackfin cisco (Great Lakes, 1960s), the longjaw cisco (Great Lakes, 1970s). Beyond that is the vast section that houses the mammals, then a short, airless corridor leads into the cavernous hall in which the hundreds of extinct birds are mounted and framed. The ceiling in this room is so high it appears one inch square when viewed from below. 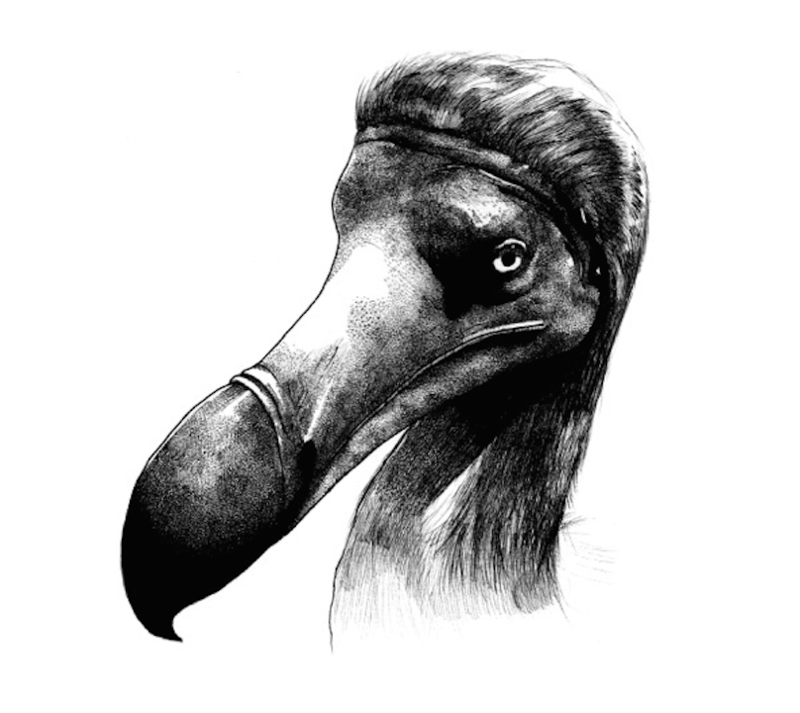 Naturally, the room of ex-birds features perhaps the most famously non-existent creature of them all, the doomed breed made famous by Lewis Carroll and which schoolchildren see when they visualise the word extinction: the dodo (Mauritius, 1693). One unavoidable question arises, one you might already have asked yourself: why does the Museum Of Extinct Animals even exist? The answer is simple: it exists for the same reason anything exists. Because it does. And if it didn’t, it too would be extinct. Your next question is already circulating in the back of your mind like a newly airborne bat: what do the people think of it? Again, the answer is simple. The people do not know about the Museum Of Extinct Animals because that would force them to confront all that has been going on these past few hundred years. It would make them – or rather, us – accessories to murder one way or another. And no one likes to be called a murderer, especially if they are good law-abiding, animal-loving, charity-giving people who don’t even know exactly what it is their own species has done. It is for their own good. Besides, if they found out about the existence of the Museum Of Extinct Animals and its precise whereabouts, humans being a species hell-bent on mayhem would perhaps kill that off, too and then someone would have to open up a Museum Of Extinct Museums. And then that too, of course, would be vulnerable to threats. January 2002. The research party had been wandering the forests, swamps and bayous of Louisiana Pear River Wildlife Management Area for many days. They had been camping under the stars and eating frugally. No one complained about the humidity and the mosquito bites, or the rashes, for they had come equipped with nets and an arsenal of sprays, creams and repellents. Modern- day explorers and conservationists don’t have to suffer like their forefathers did, and that’s one thing they could thank the chemical industry for. There was a shared common goal to the expedition, something of far greater importance than a few itchy bites and a good eight hours’ sleep: sighting the ivory-billed woodpecker. This strange and mysterious creature had been declared an endangered species on March 11th, 1967 after hundreds of years of logging and hunting destroyed its habitats and drastically reduced breeding numbers. It was then officially declared extinct in 1994, though there were some who disputed this suggestion. There were just enough voices of dissent to instil hope for the bird watchers, conservationists, academics and students that had a vested interest – whether scientific, ornithological or emotional – in the ivory-billed woodpecker. Unconfirmed sightings had been on the increase when the party entered the bayou armed with maps and binoculars, camouflage and oh-so-silent cameras, plus all the other sundry items needed to survive comfortably on an expedition into these unforgiving, barely-penetrable wetlands of the south. The first week or so passed without event, which isn’t to say things didn’t happen – they did – but they bear little relation to this meditation on extinction. There was much to see and do, so many creatures of many varieties to observe and a few million mosquitoes to evade, but the ivory-billed woodpecker remained something their minds had only ever imagined; a vision of a brilliant bird, elevated now to near-mythical status. Could it be…no? Surely not. They dared not utter its name. As nervous fingers reached for tape recorder buttons, a dozen pairs of eyes scanned the dense swampland, the fetid mangroves and the shifting shades where the undergrowth met the water. All they saw was a tangle. A tussle between life and death; a never-ending war of species on species; nature operating at maximum productivity. And in amongst it all, its creator hidden from the well-trained eyes of the research party, the thock thock thock of its industry rising up from the past. Was it? Yet it was. Whisper the words: the ivory-billed woodpecker. It was alive, praise be, alive. That simple sound of beak and bark was the sound of hope. Suddenly, all was not lost. Man’s cruel cycle of death had been defeated, the odds had been smashed. The ivory-billed woodpecker, this late lamented creature, was back and in fine health: proud, glorious, free – and oblivious to its near miss as a late entrant into the Museum Of Extinct Animals, which the party members had attended seminars on and read long, analytical academic essays about, yet which they had no clear evidence of even existing. Or at least, confided the party and their two academic leaders, we think it’s sound of the ivory-billed woodpecker. It certainly sounded like Old IB, as they had taken to calling it, for they had been up the river and into the swamps for some days now, and that isolated yet ever-shifting, ever-squirming environment had a strange effect on people. But could anyone see it? No. No they could not. Was it even the right call? With blanket silence on the bird front once again, now the seeds of hope had grown into shoots of doubt. Perhaps, suggested one student, it was distant gunfire. After all, the area was rife with hunters and trappers and hadn’t they run into that party of men yesterday who everyone had made Deliverance jokes about as soon as they were out of earshot? A couple of the other students offered murmurs of agreement: yes, it could be those crazy hunters firing their old-time Civil War guns, their echoes returning like lost postcards from the past. Quick, they decided. Split up into groups. Get organised. Search the undergrowth, explore the trees, scour the groves. The old spread-and-circle routine. There was no time to lose. Let’s undertake a clockwise sweep, they said. The entire expedition felt galvanised into action, as each felt they should be doing something in the search for the thock thock thock of the ivory-billed woodpecker. They found nothing. The sighting was recorded as unconfirmed because it wasn’t even a sighting. It was a noise, a suggestion of Old IB, a symbol of a creature that no longer exists. Maybe thock thock thock was a ghost of the last known ivory-billed woodpecker, forever trapped in the hinterlands of the bayou, wandering the dark corridors of Louisiana, its ghost beak pecking ghost trees and driving men mad for generations to come. Monroe County, Arkansas, February 11th, 2004. 697 million cameras in the world and one of them captures an ivory-billed woodpecker in flight – or the ghost of one at the very least, for who can tell the difference anyway? First one, then another, then another. Seven sightings over the next fourteen months of ghost birds or otherwise, each of a distinctive blood-red plumage. The Musuem of Extinct Animals was featured in Issue 1 of Somesuch Stories, available for purchase here. Benjamin Myers is an award-winning author and journalist. His next book The Gallows Pole will be published in May and is the recipient of Roger Deakin Award.